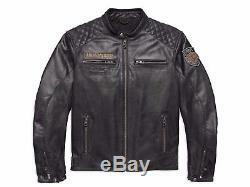 BRAND NEW 115Th Anniversary Eagle Harley-Davidson CE-Certified Men's Leather Jacket Black. Celebrate 115 Years Of Harley's Rebellious Spirit In Our Special Limited Edition. 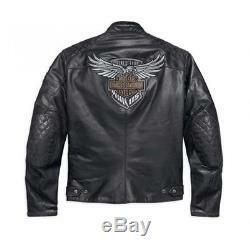 Harley- Davidson Men's Jacket Made Of: Heavyweight Abrasion-Resistant Buffalo Leather Which Offers Fantastic Protection. Emboldened With Our Anniversary Eagle And Equipped With Extra Protection. With Lightweight, Flexible EN-1621-1 CE-Approved Removable Body Armour At Elbows And Shoulders. Removable Liner Makes This Jacket Perfect. Two Zippered Hand-Warmer Pockets Add Comfort Off The Bike. Snap-Tab Collar, Cuffs And Waist Tabs. One Zipper Vertical Interior Pocket With Media Port. Stamped With Our 115Th Anniversary Emblems On The Hardware. Embossed Leather Patch And leather Applique. Meets Or Exceeds EN 13595 Requirements In Abrasion Resistance, Impact Testing And Seam Bursting For CE-Certified Personal. We Would Advise You To Choose The Next Size Up In This Style, As They Do Tend To Come In Smaller Sizing. As always we thank you for looking! The item "98006-18EM HARLEY-DAVIDSON MEN'S 115TH ANNIVERSARY EAGLE LEATHER JACKET NEW" is in sale since Saturday, November 04, 2017. This item is in the category "Vehicle Parts & Accessories\Clothing, Helmets & Protection\Motorcycle Clothing\Jackets".